This entire situation lasted, at most, 15 seconds. However, it was arguably the most awkward, uncomfortable, and confusing 15 seconds of my life. Here’s the rundown in its most simple form. I’m standing on the E train yesterday around 5pm at the 53rd and 7th Ave station. I am standing right by the doors on the back end of a subway car, so next to the door is only 2 seats, and there’s a pole behind me. The train is not overly crowded. The doors are open, and I am waiting for the doors to close so that when the train pulls up to the Port Authority station two stops later, I’ll be the first one off the train and up the adjacent steps. But before the doors close, I see a walking stick come around the corner and into the subway car right in front of me. The reality sets in instantly, it’s a blind guy, and he’s coming straight towards me. My first instinct is to move out of his way considering he can’t see me. So I back up into the middle of the car, anticipating him to feel around and find the open seat that’s right next to the door. But as I take a step back, he takes a step towards me. I back up a little more, giving him more access to the pair of seats, but he comes towards me some more. At this point, everyone nearby is watching this go down. I was well aware that someone else probably thinks I’m blocking this blind guy from getting to wherever he wants to go. Meanwhile, I gave him a clear path to feel around and find the chairs. I could have grabbed his arm and told him there was an available seat, but I’m a little iffy on touching blind people. It makes me uncomfortable just thinking about it to be honest, albeit it probably would have been helpful. A woman who watched me embarrass myself and block this blind guy’s path decides to suddenly step in and save the day, saying there was a seat next to him. The blind guy says he doesn’t want the seat and wants to stand by the pole. Bold strategy for a person without sight. But I put my disagreement aside and let him stand in the middle of a subway car. Not 10 seconds later, he starts yelling out to the entire car asking for money. After his speech he basically spins around the pole with one arm extended for anyone who wants to give him money. Then he decides he wants to make his way down the car to the next pole. As soon as I saw that happen, it hit me. No way this guy was blind. If I’m a blind guy getting on a subway, the first thing you do is reach to the side to find a wall. I don’t walk straight in because that’s not what a blind person does. You need walls. If I’m a blind guy on a subway, I’m finding a seat and not moving. I’m not surfing down the subway car swinging from pole to pole like a chimpanzee. 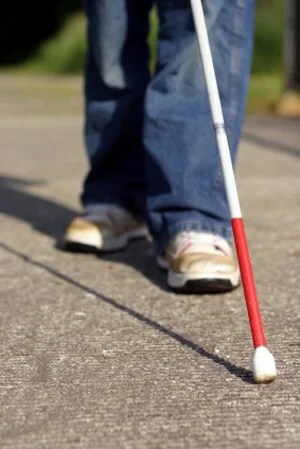 Do you know how impossible it must be for a blind man to navigate the subway system? It’s difficult for someone who can see. What was he gonna do if it was a packed subway car when you can’t move? I would have loved to see that. This guy was not blind. I’m happy nobody gave him money because it was all a scam. I bet today he’ll stage a fake fall on the subway. PS – Last week some homeless lady was asking people for money or PRAYERS. Sad how low the bar has been set. And to have the choice between giving money OR prayers is such a gift. I love New York.